The feast of these two Cappadocian Fathers is a reminder to us of the importance of Christian Unity. We know that both of them fought hard against Arianism and therefore in the cause of unity. They remind us of the need of theology to be informed by prayer - or to put it another way, that there is no true theology without a personal relationship with God. It is not simply a historical footnote that Saint Gregory Nazianzen is nicknamed "The Theologian". Pope John Paul 11 wrote that the Church (and I presume here that he meant the Roman Catholic Church) is "breathing with one lung". He went on to explain that the other lung is in the East and that Catholic and Orthodox need to unite so that the Body of Christ can breathe with both lungs. It is a terrific image because it shows the necessity of unity. The cause of Christian Unity is not an "add-on" to the Christian life; it is rather one of our main priorities. Through my involvement in "True Life in God" I have many Orthodox friends (mainly Greek Orthodox). With them I pray daily for unity. Thinking about the need for a truly spiritual theology, I am reminded of the late Cardinal Urs Von Balthsathar's view that the greatest theologian of the twentieth century was Karl Barth (Lutheran). It is men and women of faith AND prayer (real not lip-service "prayer") that do the best and most inspiring theology. May Saints Basil and Gregory pray for us that we may have true theologians and that we may advance quickly towards the reunion of East and West. 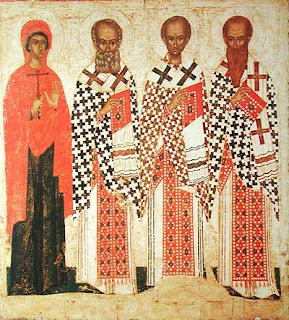 The above icon is of Saints Basil, Gregory and John Chrysostom (The Three Holy Hierarchs) and Saint Paraskeva. The inclusion of Paraskeva will be understood by readers of "True Life in God".